There's an old saying that one measure of a man is the company he keeps. A quick glance at Joe K. Walsh's schedule and you see why he's one of the hottest commodities in the mandolin community. Called "one of my favorite musicians on earth," by fiddle legend Darol Anger, Joe keeps an impossibly busy schedule performing with the finest acoustic musicians on the scene, all while holding down some very important teaching responsibilities. When Berklee College of Music found itself in need of someone with a focus on mandolin upon the passing of John McGann, they turned to Joe asking him to instruct the next generation of young, upcoming students. 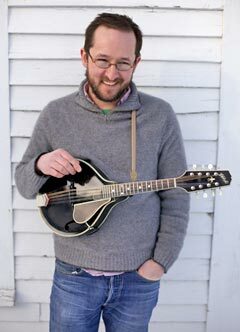 New roots-based web upstart Peghead Nation has tapped him as the intermediate and advanced mandolin instructor. Wherever we've turned of late, there he was, so it was was with great pleasure we finally caught up with Joe between Berklee responsivilities and travel to California for work with Mr Sun, his genre-hopping band with Darol Anger, or the taping of new web-based tutorials for Peghead Nation. Sit back and enjoy a brilliant talent on the mandolin and one of the most likable mandolin players around. You're going to enjoy his company. What's your earliest memory of the decision to enter the mandolin world? I remember exactly where I was when I heard the first David Grisman Quintet record. It was a game changer for me. I'd been strumming along on guitar through folk songs, and listening to stuff like Thelonious Monk and Django, but hearing that DGQ record was like looking through a window into a world of possibilities I hadn't even considered. My dad bought me one of those "pancake" style mandolins and I started going through all of the tunes and lessons on the Cafe. I was in high school in Minnesota at the time, and by chance someone at school (who I should search out and thank, profusely) arranged for Peter Ostroushko to perform for an assembly. His understated musicality and beautiful playing in his duet with Dean Magraw (an unsung hero in my book!) were equally inspiring. Joe K. Walsh, Grant Gordy & Ian Hutchison perform Roly Poly live on WAMU's Bluegrass Country. Cut forward a few years: I played all the time, college classes and odd jobs notwithstanding. After spending a couple of semesters at Evergreen State College in which I just stayed up all night most nights trying to play my way through the Real Book and transcribing solos (and reading those great interviews on Mandozine), I took a step back and realized that I had actually gotten serious about the mandolin. I was already gigging a fair amount at the time, and Peter Ostroushko was supportive and encouraging to me, so I figured I'd give it a more conscious effort. Joe K. Walsh on tour in France with the IBMA awarding winning bluegrass band Gibson Brothers. L-R: Joe K. Walsh, Leigh Gibson, Mike Barber, Eric Gibson, and Clayton Campbell. Your departure from the award winning bluegrass band The Gibson Brothers last year has you working with an eclectic mix of musicians. During the course of the work on this interview we lost track how many times you contacted us from an airport. Are you on a first name basis with the airline employees in Boston? I'm constantly grateful that I get to play with people who are so hugely inspiring and challenging, and that I have found a little niche where people seem willing to lend me their ears from time to time. I had a good run with the Gibsons, and really enjoyed the challenge of trying to figure out how best to play in that band. These days I'm working the most with Mr Sun, my new genre-hopping string band with Grant Gordy, Darol Anger and Ethan Jodziewicz. I'm also working with a trio I've got with transportive fiddler Brittany Haas and DADGAD monster Owen Marshall focused more on fiddle-based tunes and songs I've dug up or written. I do duo and trio gigs with Grant Gordy and various thirds, including monstrous pianist Tom Snow, London-based bass player Ben Somers, and all around good-vibe purveyor, bass player Steve Roy. And then a couple of times a year I get to play separate duet gigs with two of my favorite flatpickers: Scott Nygaard and Courtney Hartman. Oh, and I play a bit with folk singer Jonathan Edwards, as schedule allows. Jeez! I don't really have any trouble sleeping at night. As of yet I still have to show my ID at the airport and they don't just say "hi Joe" when I show up, but I certainly do spend a lot of time on the road. That can be a great thing, though, as it's how I stay in touch with a big part of the community, and my friends who are scattered all over the country. Tony Trischka and members of Mr Sun. L-R: Tony Trischka, Grant Gordy, Darol Anger, Joe K. Walsh, Ethan Jodziewicz. How did Mr Sun form and when we can expect to hear the band's new recording? While I was playing with the Gibsons I tried to take advantage of any free weekends by booking gigs with other projects. A couple of years ago I brought together a few of my favorite musicians (guitarist Grant Gordy, fiddler Darol Anger, and bass player Karl Doty) for what was supposed to be just a pair of gigs in Maine and Vermont. After we came off stage that first night, though, we all felt like something special had happened. Grant and Darol are both so endlessly imaginative, and Karl so constant and solid. The chemistry between the four of us, and the way everyone was so good at communicating and conversing through their instrument was totally unique. And it was really fun. I was just about to wrap up my time with the Gibsons, Darol had some time, and Grant was also winding down his era in the David Grisman Quintet, so the timing just sorta seemed perfect for giving this new band a push. Karl had this pesky little problem of having helped found a hugely successful chamber orchestra (the Grammy-nominated A Far Cry), so he wasn't as fancy free as the rest of us. Luckily for us wild bass prodigy Ethan Jodziewicz appeared on the scene just as things were coalescing for us, and Karl slipped into the role of Bass Player Emeritus. We've got a record that'll be coming out this year, probably in the summer, entitled The People Need Light. We all love so many kinds of music: bluegrass is hugely important to each of us, and we're also really lit up by the aesthetic and improvisatory commitment of the jazz world. Those of us in the band who aren't Darol are indebted to and inspired by all of the genre-blurring music he's created over the years, too. I think this record reflects all of that. The most exciting thing about this band for me is that the music comes out different every night. The loose story line stays intact, but everyone has such big ears and is always on their toes, so there is so much room for flexibility. L-R: Guitarist Owen Marshall, fiddle great Brittany Haas and Joe K. Walsh. Berklee College tapped you to lead their mandolin students upon the passing of John McGann. What is your day at Berklee like and what might students gain from your broad experience? John was and is a role model for me, as well as many others. He was a serious student of music, with exceptional depth and breadth, and he was always able to inject some levity into the classroom/concert/conversation. And he was so generous with his knowledge! His shoes were big enough that no one person on earth (that I know of) could've filled them when he passed on, and at Berklee it's taken a number of us to try and fill the space he left. One of the teachers that has picked some of work John started is Jason Anick, the great jazz violinst/mandolinist who is, of course, also on faculty at Berklee. I encourage my students to focus on what is emotionally relevant. Whatever sound is catching your ear and really moving you, that's what you should be chasing. I'm on campus one day a week, teaching private lessons and a pair of ensembles. There are currently a handful of mandolin students on campus, and a handful of students interested in bluegrass and/or improvising in a bluegrass and/or new acoustic style, and I get to work with a lot of them. Private lessons over the course of a student's time at Berklee follow a grid of topics that ought to be covered (as in certain scales, certain arpeggios, certain harmonic concepts, etc. ), but also allow for some stylistic flexibility from student to student. The two ensembles I'm leading this semester are really exciting! One is focused on the repertoire and arrangements of the early David Grisman Quintet, with all the twin mandolin parts, and the other one is dissecting the tunes, arranging, and playing on Uncommon Ritual and Tales From the Acoustic Planet. A big part of the attraction of studying at Berklee for me was learning how to analyze and deconstruct music with the goal of increasing my knowledge and control over what and how I was playing. Having been through the system myself at Berklee, and having applied that skill set to various playing situations over the years in a broad array of styles, I've got a host of experiences to draw upon to help students move forward. Joe K. Walsh and Ronnie McCoury, WAMU special concert, Washington, D.C. with The Gibson Brothers and Del McCoury band. L-R: Jason Carter, Clayton Campbell, Joe K. Walsh, Ronnie McCoury, Rob McCoury, Alan Bartram. Roots music might not be the first thing most students will associate with Berklee but has that changed, hasn't it? Roots music has really found a great home at Berklee. Matt Glaser started and is running the American Roots Program, and through it various monstrous musicians (such as Andy Statman, David Grisman, Mike Compton, Punch Brothers, and Alan Bibey, not to mention numerous fiddlers, banjo players, and others) have spent time on campus. The idea is to bring in a broad array of high-level players from all sorts of roots styles to work with the students. The >Berklee Roots Weekend which I'm the associate director of is the condensed version of that, in the form of a weekend long camp for anyone who wants to spend a little bit of time at Berklee. This summer we'll have Tony Trischka, Bruce Molsky, Matt Munisteri, Darol Anger, Matt Glaser, Viktor Krauss, Paul Rishell, Annie Raines, and others teaching their various styles. Last year was the first year, and it was a hoot! Joe Walsh as part of Merlefest 2012 Mando-Mania. L-R: Sierra Hull, Joe K. Walsh, Tony Williamson, Sam Bush, Chris Thile. As the first graduate on mandolin in 2003 and now as a faculty member you have a unique perspective on the Berklee experience. What would you tell a perspective student that might be reading this interview? Berklee was and still is a crazy place. It's an electric hive of extremely talented musicians, and it's almost impossible to show up there and not be intimidated. Ideally the intimidation goes hand in hand with inspiration, though, and the best result is when that inspiration leads to some serious hard work. Even though I was the only mandolin player for the first year or two I was there, I still was very acutely aware of how high the level of playing was amongst some folks in the student body. For me that just became an incentive to work hard, and Berklee became a great vehicle for growth. The scene at Berklee now for mandolin players and for folks interested in roots music is so much better now than it's ever been. There are so many great players, a wide array of great teachers (such as Darol Anger, or Mark Simos, a songwriting instructor who penned some of Allison Krauss' hits) and the support and offerings of the American Roots Program. I wouldn't change the experience I had at school, and it's all worked out in a way that I'm exceptionally grateful for, but I do think that now is a very special time for the scene on campus. Joe K. Walsh with Psychograss. L-R: Tony Trischka, Darol Anger, Joe Walsh, Todd Phillips, David Grier. Who are some up and coming Berklee mandolin students we'll be hearing from in the future? A couple of recent grads that are giving the mandolin a good name out in the world include Matt Witler of The Lonely Heartstring Band and Dan Bui of Twisted Pine. Bryce Milano graduated just a bit ahead of them and is always a revelation: I'm not sure what he's doing at the moment but I'm sure it's creative and inspired. JD Williams plays some great bluegrass and is about to graduate: he's already known in bluegrass circles in New England and Europe through his work with Amy Gallatin and his father, the great dobro player Roger Williams. Jake Howard and Gordon Neidinger are two talented players on campus who are sure to update the definition of what's possible on the mandolin. Darol Anger, Joe K. Walsh, Ethan Jodziewicz and Grant Gordy perform The People Need Light, the title track from their upcoming recording. What factors were behind choosing your black-faced Gilchrist as your primary instrument? This mandolin just sounded good to me. There are good As and good Fs (sounds like something I would've tried to say to my parents, report card in hand, years ago! ), and I think this one happens to be a good A. As it happened, it took me a long time to save up enough money to buy it and the fact that it was an A helped make that possible. It's a 1993 Model 3, number 93252. I was told it was one of the only all black mandolins he made, but then I ran into its sibling mandolin over in Germany, which was owned by a Italian mandolin player named Massimo Gatti. I found mine on the wall of a fiddle shop in Freeport, Maine. I played it for about a minute, did a quick calculation of how much money I didn't have, and promptly put it down before I got attached. A couple of years later I'd saved up some money and went looking for it, and was told it had been sold to someone on the west coast. I did some poking around and found out it was on the wall at Gruhn Guitars, and I had the mandolin sent up to Maine. I had a day to yea or nay the purchase, and after fretting over the price for 24 hours I boxed it up and brought it to the post office to ship back to Nashville. About an hour later I had a student bail on his lesson. I'd been freaking out that I'd made a mistake, so I rushed back to the post office and talked them into giving me back the mandolin. This mandolin has been really good to me. I used it on the last Gibson Brothers record that I was on, and on Darol's most recent record, the upcoming Mr Sun record, and on various other projects lately. It may not be my last mandolin, though, as I'm still curious about finding the ideal partner. I've got a Nugget on order that's due to arrive any time. I've never had a brand new mandolin, and I have to say I'm really psyched to go through the process of committing to playing it a lot and seeing what it becomes. I've always dug the way his mandolins sound, and I'm really excited to get to know this new ax. Joe teaches Chinquapin Hunting on Peghead Nation, accompanied by Scott Nygaard on guitar. You and Sharon Gilchrist are the mandolin instructors at Peghead Nation, a new venture in online roots music education. Sharon teaches a beginner track and you handle intermediate and advance topics. What was the catalyst for your selection as one of the instructors? Scott Nygaard (one of the three founders of Peghead Nation) plays in a way that I've always wanted to try and emulate. So lyrical and inventive, with this huge, singing tone. I took a lesson with him years ago, and we became friends and ending up cutting a record together (with fiddler Lauren Rioux) a few years ago. As he wound down his time at Acoustic Guitar, he and some of the other key players at that magazine got to thinking that an online magazine and teaching site was going to be their new project. I'm honored that they asked me to join as one of the mandolin teachers. I've taught at camps for years now, and my goal is always to teach tunes that are fun to play but that also make good vehicles for learning a musical concept. That's the ideal for me: you learn a tune, and embedded in that tune is a musical concept that you can apply in other situations. That's my approach to teaching on Peghead Nation: using various songs or fiddle tunes to teach lessons that demonstrate concepts like diatonic double stops, simple swing changes, arpeggios, etc. Joy Kills Sorry, 2005 in Boston. L-R: Bridget Kearney, Matt Arcara, Heather Masse, Adam Larrabee, Joe K. Walsh. In some of our casual conversation in prepration for this interview one of the comments you made that stuck with us was that you live to improvise. What kind of studies and listening do you engage in to further your knowledge of improvisation? I think about improvisation all of the time. Making it a priority on every tune every time I play is the way I try to be most present in every musical conversation. Improv, for me, means constantly listening to what's happening and trying to find the best way to support and further the musical story. It's an unreachable and frequently humbling goal, but it keeps music fascinating and always challenging. I see parallels in actual conversation: we can fall into the verbal equivalent of "licks" so easily, but in the best conversations we aren't just waiting for our turn to use our prepared line and are instead listening to what's being said and letting that guide our response, and following the conversational thread wherever it might go. In a more tangible sense, I'm always trying to transcribe solos that broaden my musical vocabulary, whether harmonically or rhythmically. I've learned tons of solos from lots of the great mandolin players (Tiny Moore most recently, what a heavy cat! ), but learning solos from other instruments. Wynton Marsalis' off-hand take on I'm Confessin' is also a great way to force me out of my usual fretboard pathways. Your style is so supportive and fluid. To our ear you define the three Ts of great player: Tone, Timing and Taste. 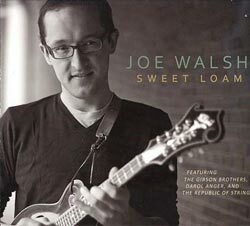 Joe K. Walsh's solo recording Sweet Loam from 2011. That's definitely what I try to be, and sometimes it feels like I might hit a note or two that embodies two or three of the Ts. My goal is always to serve the music, and to find the best thing I can play (or not play!) that will help support the moment, the song, the message, and the other players. I can always get better at this, and I'm constantly working on that goal, but I really try and make sure every single note is in the pocket, and is singing, and is needed. I've never been a fireworks kind of guy, but for the most part neither are my heroes. They've found a way to make subtlety moving. That's my goal, too. Your last solo recording, Sweet Loam, was released in 2011. It's clear you keep busy writing new material. What are the prospects for another Joe K. Walsh solo project in the future? Oh man, I'm overdue for sure. The Mr Sun record was the priority in the last year or two, and I did a lot of writing and preparation for that. I've got a good bunch of tunes and songs that didn't really seem stylistically suited for that band, though, and I'm thinking that I'll try and corral some of that into a record this fall. L-R: Rock and roll legend Joe Walsh of The Eagles with Joe K. Walsh. You may leave a comment if you have a Mandolin Cafe Forum account. Clicking "Post a Comment" below will take you to the forum where you can complete this action. Please note that once you have, your comment will appear both on this page and on our forum. YOU MUST BE LOGGED IN to your Mandolin Cafe forum account to comment. Great interview. Just saw Mr Sun here in LA and was extremely impressed. Joe has such beautiful tone and makes it look so effortless. A rising star for sure! Superb interview! Just saw Mr. Walsh last night with Grant Gordy and they tore it up from Irving Berlin to Bill Monroe. Pick on, sir! I saw Joe with the Gibson brothers a few years ago in Dallas, and he picked a little with us afterwards. He is such a class act and a real monster player. He can play all the notey stuff that's popular now, but he can tear up a Monroe-style bluesy double stop solo as well. I've glad to hear he's staying busy and getting more recognition. Man. Joe is one of my favorite players. So light, quick and subtle. And it seems his playing doesn't get stuck in one style or sound. He's so dang original. I could (and do) listen to his playing all day. Great interview! Joe has become one of my favorite mandolin players, nay, favorite musicians to listen to over the last couple of years. Seems like he always is doing something different, but perfect for the song. Beyond stoked to hear the Mr. Sun album. Great interview. Totally agree with all the comments. Really good. Every incarnation just gets better and better. Caught Mr Sun at Wintergrass this year. Amazing show, amazing collaborative musicianship. And they were having SO much fun! Looking forward to the record. Thanks for a great interview. I've had the pleasure of attending Mr. Sun shows, 3 years running as the band has evolved. Joe can sometimes be found gigging in a Southern Maine pizza pub with some equally talented players. Joe conveys very real joy when he plays; it's obvious that he and his fellow musicians are enjoying the musical conversation. Great interview! Joe is one of my favorite mandolin players. Seen him tearing it up with the Gibson Brothers and also at a local house concert. I recommend his cd Sweet Loam and also the Peghead Nation lessons. His mandolin of choice also makes me a proud A-style (Girouard) player. I too have been listening to Joe Walsh a lot. Very inspirational and probably my favorite young mandolin player. I love his playing on Darol Anger's E and A. Great interview. Thanks for the interview. Here in Maine we tend to think of him as one of our own...but clearly he's gone to the world! I was most fortunate to have Joe as an instructor at the Ossipee Valley String Camp last summer....GRRRRREAT teacher and what a pleasure to sit with him in class and then hear him perform at night. Thank you for the interview! Does anyone know whether Joe is anticipating an A or F style Nugget? Not that it matters, but I am curious. I just saw where he responded to that question on Facebook and it is an A style Nugget. Noting today's anniversary of this interview from 2015. Special thanks to the Mandolin Cafe's primary business partners.